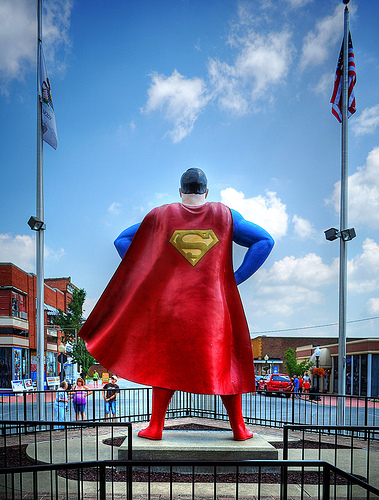 The good citizens of Metropolis this week are celebrating that champion of “truth, justice and the American way” — Superman – because DC Comics designated the Illinois locale as the hometown of the Man of Steel. Their 43rd annual, four-day “Superman Celebration” started Thursday, June 11, and features a costume contest, film festival, and superhero tug-of-war pitting Superman fans against Batman fans. Adding to the fun, participants eat gelatin made to look like Superman’s weakness, Kryptonite. In 1972, city leaders convinced DC comics to declare Metropolis the “Hometown of Superman.” Since then, this real-life Metropolis, which looks as tiny as Superman’s boyhood town of Smallville, swells in population from 6,500 to nearly 50,000 every year during the festival. 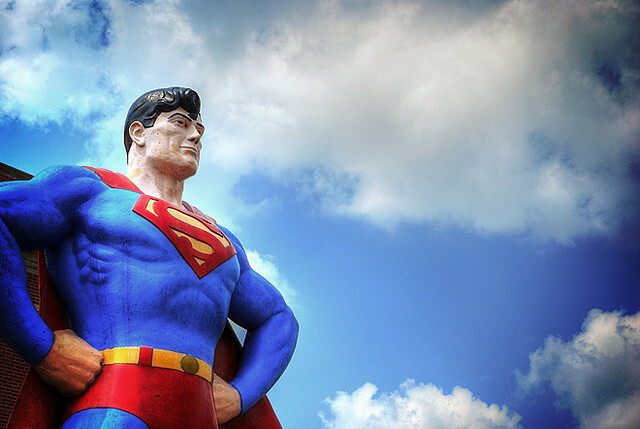 The town has erected a statue to honor their homeboy (pictured, right and above) and opened a museum that displays props from his movies and the TV series, and has collected just about every Superman toy ever produced. While Superman’s alter ego, Clark Kent, and his love interest, Lois Lane, work for the Daily Planet, the Metropolis newspaper is the weekly Planet – and in the 1990s, had both a Lois and Clark on their small staff.